On 19 September 2018, I wrote that I would be back here 2592000000000 microseconds later, but as always I’m late. Whatever… For human beings microseconds, nanoseconds, or attoseconds, are of no importance. I even forgot to write a short blog post to announce that my new book on high-frequency trading , “4“, dedicated to the recent radio/wireless networks built for HFTs (a extended version of the now-famous HFT in my backyard series I wrote here), was released in January, but I assume most of the readers of this blog follow me on Twitter. Anyway, I was quite busy with the book launch (which is quite impressive, more than expected—check out some of the press reviews compiled here, thanks Marcos for that), interviews, a film shooting for German/French TV Arte (about HFT), etc., and above all my own business (a book company) I have to run (success is nice, but time-consuming). I wanted to write a post about my previous books on HFT, and why I’m trying to work on/understand the small world of HFT and market microstructure, but that will come later. In the meantime, I want to share that: 1/ a nice and beautiful francophone Belgian magazine, Wilfried, released a new issue yesterday where you can find (in French) the first 15 pages of my new book (slightly remixed), adorned with very nice photographies made by a talented photograph who took a drone in this very special area I talk about here (for those who read this blog, it’s the area around the radio tower in Houtem purchased by a HFT firm from Chicago in December 2012—this area is named “Les Moëres“, which is also the title of the first chapter of the book); 2/ as I’m discussing with anglophone publishers about the English translation of this book (seems a lot of people want to read it), I commissioned a translation of these first pages, so that the American/English publishers can “preview“ the book. I do not see why I could not share this translation with the readers of this blog and my lovely Twitter followers. So, here is an English version of the beginning of “4”. Thanks a lot to my translator, Daniel Levin Becker, and to Jelle Vermeersch, the photographer who shoot Les Moëres for Wilfried, who allows me to reproduce here some of very nice pictures he took (click to enlarge them). There are no photos in the original French version of the book, except the black and white one, but I think that for this online version some historical documents are interesting, besides Jelle’s photos (if you like polders and read French, check out Belgian writer Chris de Stoop’s nice text in the same issue of Wilfried, and his book Dit is mijn hof/Ceci est ma ferme). This part/beginning of the book is all about liquidity, straight lines, land occupancy, wars, religion, military occupation, radio networks, but has nothing to do with high-frequency trading (the reason I like it :-)… at least until December 2012. I hope you’ll enjoy it—take a breath, it’s long. Happy reading. A few months shy of retirement, the auctioneer was surely not expecting the most epic bidding war of his career. On that gray morning of December 19, 2012, in a room in the brand new building housing the federal office of the province of West Flanders, in Bruges, the public good 38025/838 SV, described as a “Gewezen militair domein met communicatietoren (hoogte 243,5-m) en acht ankerpunten,” with a surface area of 1 hectare, 31 ares, and 66 centiares, situated at 1 rue du Héron, in Houtem, in the region of Les Moëres (De Moeren, in Dutch), was put up for auction by its owner, the Ministry of Defence of the Kingdom of Belgium, at a price of 250,000 euros. At 10 a.m., without a single microsecond’s delay, eleven people gathered around a large rectangular table. The auctioneer, his secretary, and a representative from the Ministry took their seats at one end of the table, while across from them three different groups settled in, glaring at one another: an American accompanied by two lawyers; two other lawyers working for a prestigious Belgian firm retained by a potential buyer; and two engineers, who would remain silent throughout the morning—they had come not to buy but to find out who would prevail, information of capital importance to a number of people in France, Canada, the Netherlands, and the United States. Despite the presence of a high-end law firm—rather unusual, given the dilapidated state of the “former military property containing a communication tower measuring 243.5 meters high” that the Ministry wished to get rid of—the session began calmly. The auctioneer verified that the participants had duly supplied their 1,000-euro registration fees, ensured that they all had in their possession the administrative documentation concerning the property—including the cadastral survey, on which the military property appeared in the shape of a cross—and then set the bid increment (or tick size) at 5,000 euros, and the sale began. What should have been no more than a formality turned into a long morning over the course of which the auctioneer was put roundly through his paces. After just twenty minutes, the highest bid was already 700,000 euros, which thrilled the Ministry of Defence (which had secretly concluded that it would make out handsomely on anything over 400,000 euros) but destabilized the auctioneer. He decided to raise the bid increment to 10,000 euros in order to accelerate the sale, after which the highest bid quickly reached 1 million euros, then 1.1 million euros, 1.2 million euros, 1.3 million euros, 1.4 million euros… By 2 million, one hour later, the increasingly sweaty auctioneer called a recess and took refuge in the restroom to compose himself. History gives no record of what went through his thoughts as he looked at the bewildered face in the mirror. “On the sellers’ side, nobody had any idea what was happening,” recalls a witness, himself all the more surprised by the amount of money that, under other circumstances, he could perhaps have bid himself. That year, the Kingdom of Belgium, in pursuit of liquid assets, had already sold off a number of demilitarized installations for a total of 12 million euros: an old bunker, sold for 350 euros to a farmer who was delighted to be able to demolish it because it stood in the middle of his field; a former fort, constructed to defend of the city of Antwerp, bought for 287,000 euros by the rich CEO of Katoen Natie, a logistics company active in ports around the world; a former military hospital, bought for 4 million euros by the commune of Bruges to be transformed into social housing. Joining this 12 million, on December 19, 2012, was the result of the sale of the “former military property containing a communication tower measuring 243.5 meters high.” After over three and a half hours of intense battle in front of the dumbfounded representatives of the Belgian state, the good 38025/838 SV was finally awarded for 5 million euros, the Ministry’s best deal for the year 2012. As the silent engineers hurried out of the room in the federal building (their car, unhappily parked in front of a police station, having long since run out its meter), one of the lawyers working for the side that had won the day was approached by one colleague representing the defeated side. The loser handed the winner his business card: “If we can arrange, here is my phone number.” On January 9, 2013, the Ministry made public the deed of transfer of the property without divulging the name of its new owner—“confidential information,” per the ministerial press office. Much earlier that morning, before the public sale began, the participants had gone to visit the property, a detour required and arranged in advance by the Ministry of Defence so all could take note of the state of decay of the infrastructure. Under gray skies, they traveled by car to Houtem, 9 kilometers from the dunes of the North Sea and 400 meters from the Franco-Belgian border, in the region of Les Moëres. A fanciful etymology traces the word Moëres back to “Morini,” the name of the descendants of the ancient Celtic tribes who had lived there in palafittes, wooden houses on stilts that rested on stone mounds known as pols. These prehistoric lakeside cities were likely the first form of human habitation in a region whose subsequent history was marked by a long and unequal struggle against liquidity. In the Neolithic era, Les Moëres was part of the delta of the Aa (a river whose source is in France, south of Saint-Omer), an immense gulf ranging from Calais to Nieuwpoort. Only a few islets of land emerged, on which the Morini set up their palafittes. When Caesar’s troops arrived in Morinia, the region was just a huge chain of putrid swamps, far from ideal for a military occupation. Nonetheless, according to his Commentaries on the Gallic Wars, Caesar had enormous difficulty getting the best of the Morini: “Of all people, the Belgians are the bravest,” he wrote, a formula the inhabitants of this flat country still like to quote to this day, even though in reality the word bravewas meant to highlight the boorishness of the local “barbarians.” By dint of lengthy battles, the Romans finally subdued the Morini, but did not settle in this inhospitable region. They were more interested in the port of Boulogne-sur-Mer, farther south, from which they planned to invade England. It is also possible that they decided to keep the marshes intact since, when they were flooded by the sea (which occurred frequently), they formed a natural impregnable barrier, thus protecting the territory from regular incursion by the Saxons. Nonetheless, year over year, with efficient drainage, Les Moëres were sometimes able to be cultivated, at least until the fourth century, when the Aa delta was entirely submerged following a brutal climate shift. The gulf then transformed into an immense sedimentary basin where peat and clay began to appear. When, a century later, the Roman Empire crumbled, a few missionaries attempted to Christianize Morinia, but without any real success. It would not be until the sixth century that the Christians finally occupied the muddy terrain in a sustainable way, beginning a slow and complex process of water control. The first people responsible for draining the swamps were probably the monks from the abbey of Saint-Augustin-lès-Thérouanne, founded in 544 a few kilometers from Saint-Omer. A papal bull confirmed to the monks that any terra nova, legally defined as a “land that has been subtracted from the impetuosity of the sea’s tides and floods, by man,” would automatically belong to the abbey. It is not insignificant that the Benedictines, who later colonized the north of France, came from the English region of the Fenlands, a swampy territory where the monks had tried various techniques for drying up the waters by draining the liquidity. Thanks to this expertise, the Aa delta began slowly to dry out, certain rivers were canalized, and the Neolithic polsturned into polders. But the bad weather and the floods came regularly to ruin the monks’ labor: sometimes entire regions, polderized and then cultivated, found themselves underwater in a single night. Despite rapid Christianization, which led to new ways of occupying space,and the construction of several monasteries involved in drying the territory, draining such large quantities of water was punishing work – a bottomless pit. For that matter, since every terra nova, or agri occupatorii, became property of the monks, some of the region’s inhabitants were forced to continue living in landscapes saturated by pestilential water that sometimes caused lethal epidemics of malaria or fever. Outside of the zones controlled by the Benedictines, and then by the Cistercians, each community did what it could to make the water the neighbors’ problem, until finally, faced with disease, everyone decided to form artificial lowland lakes, far from residential areas, called “Moëres,” from the Dutch moer, or “marsh.” It was only with the accession of the House of Flanders in the tenth century that the anarchic management of the lands’ drainage came to an end. In the twelfth century, Philip of Alsace decided to dry the entirety of the coast, from Calais to Nieuwpoort, which was then divided into four sections called wateringues. This titanic construction still did not entirely meet its objectives: floods, spring tides, tempests, epidemics, military conflicts, and famines undermined the enterprise. Nature was a hostile ground, something to be ceaselessly fought and transformed. On the other hand, the fourth wateringue, that which is now Les Moëres, did not make any noteworthy progress. One of the richest European abbeys of the era, Ten Duinen Abbey (Abbey of the Dunes), founded in 1107, Benedictine and then Cistercian, situated a few kilometers to the north of the marshes, nonetheless had its hour of glory, financially and intellectually, in the thirteenth century. It boasted a vast domain of several thousand hectares, all along the coast from Dunkirk to the Netherlands, which saw the construction of numerous barns and other outbuildings. But the Cistercians were hardly worried about Les Moëres, which nonetheless counted among their possessions at the time. They simply built a farm, the Groot Moerhof, on a spit of land that cut into the marsh, the highest point in the region, in order to exploit the peat that had formed around the swampy lake when the Quaternary forests were submerged by water in the fourth century. In reality, this exploitation only made the situation worse: extracting the peat required the extension of the marsh, and the water became more and more invasive, reducing the surrounding cultivatable surface area accordingly. The Abbey enjoyed great prosperity, but the monks left the natives to marinate in the stagnant waters of Les Moëres, which, protected from the sea by sand dunes, had become an interior lake whose altitude ranged between 2 and 4 meters above sea level, and from which the liquidity could not escape. Ceteris paribus, the Abbey of the Dunes also had to pit itself against nature to survive: in addition to the Hundred Years War and assaults from the Calvinists, it was beset by extremely frequent floods which gradually took over the occupied lands, diminishing the monks’ financial revenues. The Cistercians became scarcer and scarcer, and only about twenty of them still occupied the Abbey when the Protestants finally burned it down in 1578. Unable to continue funding the maintenance required to reinforce the dikes separating them from the sea, the monks were ultimately overtaken by the sands. The few who remained in the community took refuge in one of the monastic barns they owned, some kilometers from the silted-up abbey. The end of the Cistercian occupation of the grounds around Les Moëres once again aggravated the situation, the waters that had been drained by the monks once again flowing into the interior lake and not into the sea. The polderization of Les Moëres was almost completed some time later, thanks to the colossal works of a remarkable painter, architect, engineer, and economist. Born in 1550 in Antwerp, Wenceslas Cobergher spent the first half of his life in Italy, until Albert and Isabella of Austria, who ruled the Southern Netherlands, arranged for his return to Brussels around 1604. Named lead engineer by the archdukes, he built several churches and painted some canvases in and around Brussels, and also occupied himself with “economics.” He was responsible for the first mount of piety in this part of Europe, which opened in Brussels in 1618 at the behest of Albert and Isabella, a project he defended in a text in verse entitled Apologia ofte Bescherm-redenen tegen het kekelen van de onredelijcke vyanden, ende oock de tegenraeders, van de Berghen van Bermherticheyt (“Apology or defense against criticism by the unreasonable enemies and adversaries of the Mounts of Piety”). Mounts of piety had been created by Italian Franciscans in the second half of the fifteenth century to combat the abusive practices of Lombard usurers and Jewish bankers, who lent money at an interest rate of 30 to 40 percent, whereas mounts of piety, semi-public institutions, charged only 15 percent. Cobergher went on to create more than a dozen mounts of piety in the Netherlands but, like the archdukes, had to face opposition from Lombard lenders, who were defended by certain theologians, and from the authorities of the city of Brussels, who did not look too kindly on the fiscal privileges accorded these new mounts of piety and those who worked in them. The “industrious Cobergher” nonetheless received considerable support from the Jesuit Leonardus Lessius, an eminent but unfairly unrecognized thinker of modern economics,who, in his monumental treatise De iustitia et iure, published in 1605, defended these public institutions: “It is necessary to work hard and to do everything we can so that such mounts may be erected everywhere in our cities—after the suppression of usurers who exhaust the resources of people everywhere by dominating the market.” For Lessius, who was not opposed to the market per se, “economic salvation” would come by way of, among others, these “mountains of money” which lent at reasonable rates and participated in a more equitable distribution of wealth. “Bono publico nati sumus,” the Jesuit affirmed: we are born for the public good. It was by respecting this precept to the letter that Cobergher, some years later, returned to his role as engineer to take on the simultaneously technical and economical project that was Les Moëres. It was necessary, at first, to deal with certain legal disputes relating to land rights; among other issues, the Cistercians of the Dunes, though silted in, invoked an old fishing right over a part of Les Moëres. 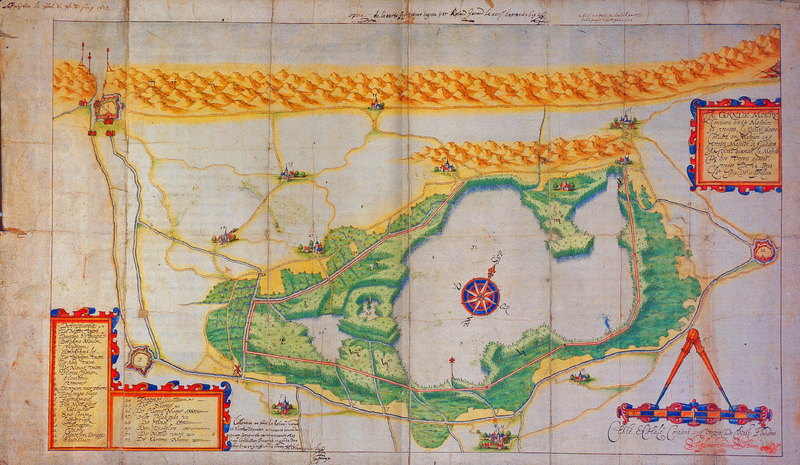 Others came to claim parcels of land, but the archdukes decided unilaterally to appropriate the marsh and declare that three fifths of the future terræ novæ belonged to them (along with wind, water, and fishing rights), reserving the remaining two fifths for Cobergher to do with as he pleased. Cobergher the engineer remained faithful to Cobergher the economist, proving more charitable than the Cistercians: in order to keep rich entrepreneurs from coming to buy the lands once these had become fertile—as they promised to be—he ensured that those who worked for him on the drainage project would be exempted from taxes throughout the construction and for six months thereafter, a fiscal advantage that could potentially be renewed in such a way as to attract a population of poor workers who would then occupy these new lands. Work began in 1619. Cobergher began by establishing a dike all around the lake, which formed an ellipse of 30 square kilometers. All along this dike, he had a canal dug 3 meters deep and 20 kilometers long: the Ringsloot, or “ring canal.” This Ringsloot then connected with another 10-kilometer canal (“Canal des Moëres”) that went as far as Dunkirk, where, at low tide, the water from Les Moëres could flow through a lock into the North Sea. After three years of colossal labor to complete this first phase, Cobergher turned to the most arduous task: extracting the water from the lake to transport it to the Ringsloot. Here he decided to use wind against water: he had 23 windmills constructed along the ring canal, each equipped with a vertical screw in the shape of a helix (known as an Archimedes’ screw), so that the power of the wind could lift the water from Les Moëres. “When these machines, which served at the same time to grind wheat, began to work and we saw torrents of water flowing into the Ringsloot, and at the same time the water level lowered in Les Moëres, and then toward the end of the year the land became visible in several places, there was general enthusiasm in the region,” reported the local historian Louis Quarré-Reybourbon in 1892. The liquidity appeared to have been defeated. But new disputes related to grounds and water management arose at the end of 1622. Due to the works Cobergher had done, the administrators of the wateringueabutting Les Moëres (to the south of the lake) could no longer evacuate their water properly. They brought the case to court but were quickly dismissed. Shortly thereafter, the recent polder was literally attacked by town counselors from the village of Veurne (to the north of the lake this time). With the agreement of the Abbey of the Dunes, which surely saw this as an opportunity for revenge, they broke a section of the dike surrounding the Ringsloot and stole the reeds that Cobergher’s workers had used to cover the mills. Between this tense climate and a wind so unfavorable that the mills remained immobile for at least six months, Cobergher could not finish his great project: stagnant water remained in the shallows of the marsh. The engineer, so as not to be “hastened with wyfe and chylde toward his euident ruin” when “by industrie and extraordinary labour” he “hath surmounted many difficulties at great personal expense and risk to his lyfe,” requested an extension to finish the job and ensured that anyone conspiring against his enterprise again would be brought to justice. By the end of 1626, for the first time in almost five thousand years, there was no more liquidity in Les Moëres. To do away with the last of the moisture, Cobergher had cut the 30 square kilometers of new polders into 114 cavels, rectangular “agricultural racks” measuring 220 × 109 meters, sanitized by underground ceramic drains and surrounded by secondary channels leading the water from the shallows toward the Ringsloot. Rapeseed began growing all around the canals’ 28 kilometers. As planned, the engineer took possession of the space reserved for him but quickly sold his landed properties: Cobergher, decidedly more hospitable than the Cistercians, had also negotiated a certain number of “privileges” for those who bought these new lands, particularly a tax exemption and the assurance that no good would be consigned to military use. Moreover, since maintenance of the Ringsloot was essential to the continued drainage of Les Moëres—the residents’ life and work depended on it—he ensured that the villages were endowed with a communal administration whereby business could be managed collectively by the citizens. Alas, twelve years after Cobergher’s death, during the Thirty Years War, Dunkirk came under siege. The Spanish who took over the city decided to close the locks and break down the canal dikes in order to create an aquatic line of defense, and Les Moëres was submerged in a night. All habitations and farms were destroyed. Only the church survived, its cross-capped bell tower emerging above the water, the only visible trace of a collective prosperity now disappeared. It would take two more centuries for the drainage of the lake to be complete once more. A more recent technology, the steam engine, allowed the windmills to remain active even without wind. These water pumps were then named after rivers (Po, Rhine, Danube, Tagus, Ganges, Seine…). The primal state of Les Moëres was wild, swampy, and foul. Its second state—dry, benevolent, molded over centuries by relentless human effort and engineering—attracted many farmers, often from far away. But the water would return: during World War I, the French, taking their cue from of the Spanish, flooded Les Moëres to prevent German troops from entering their territory through Belgium. 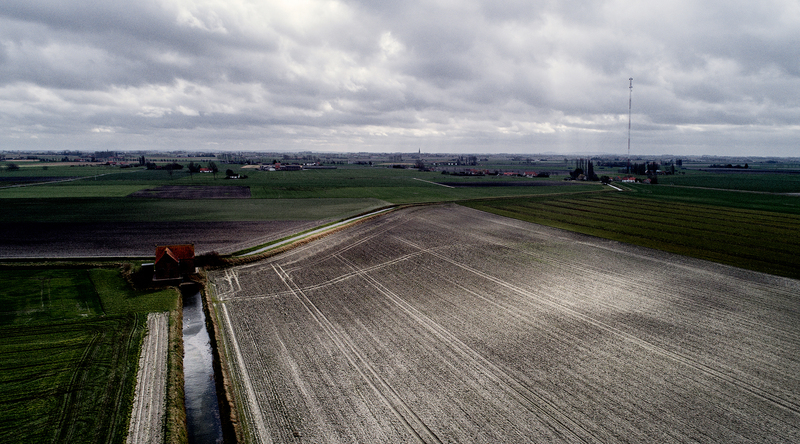 Emboldened by this experience, the Germans anticipated this maneuver in World War II and flooded the polder themselves to slow the advance of French troops. The polder had become its own military apparatus—a liquid one. Les Moëres as designed by Wenceslas Cobergher. Drawing included in the book. “At first glance, the aspect of Les Moëres seems monotonous and stark,” wrote Quarré-Reybourbon, “but bit by bit a particular charm can be discerned in the landscape in spite of its monotony.” When, on December 19, 2012, the potential buyers of the military property put up for sale by the Ministry of Defence arrived near the Franco-Belgian border, the sky was as gray as the land. The terrain of the quadrangular fields is made up of clay and muddy gray sands, the ground is carved into greenish rectilinear canals, and in winter, when the fields are bare, the whole thing melts into a single ash-colored horizon. Perfectly flat, the lands extend as far as the eye can see, their flatness reinforced by the altostratus clouds from the North Sea. It is a surprising atmosphere, arousing the strange feeling of being in a reticular nowhere from which possible horizons somehow radiate, one where time seems to stand still. 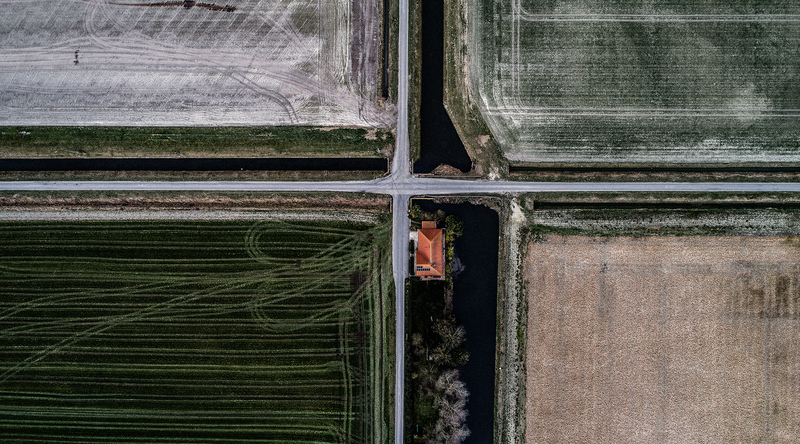 The polder’s uniformity is reinforced by the grid of agricultural parcels, by the perfectly straight lines of the hydraulic network and of the paths—a model emblematic of that rectitude which some see as an icon of modernity, the triumph of human rational thought over the vicissitudes of the natural world. 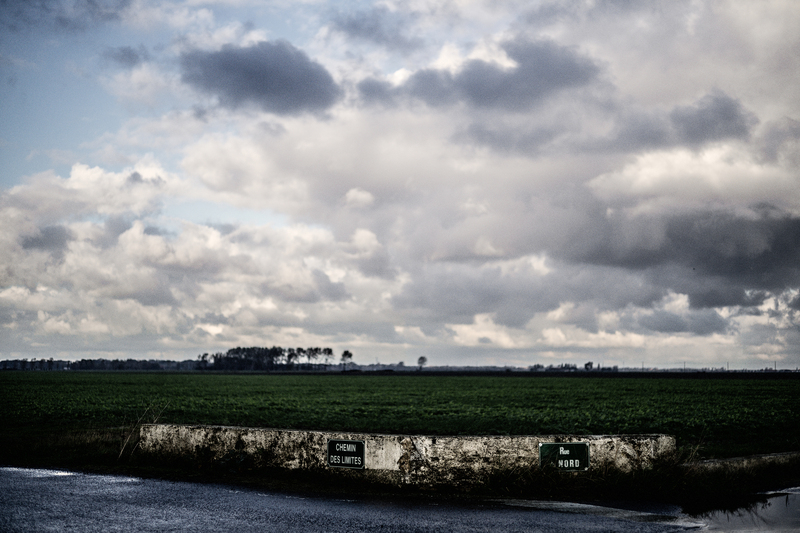 As you travel slowly up this rectilinear road, the monotonous horizon of Les Moëres begins to spread out in silence the farther you get from the highway, a silence interrupted frequently by herons taking flight. At the end of this 5-kilometer straight line, after it has crossed the Ringsloot and left the “Path of the Octagon” on the right (where an electric water pump has since replaced the Ganges mill), is a field from which emanates a strange, undefinable sound: a continuous, almost electric vibration, a whistle distinct from the wind’s. You simply follow this unusual sound wave across the field to arrive at 1 rue du Héron, in the small village of Houtem, where you will find the former military property sold by the Ministry of Defence. With the exception of a small maintenance shed, the property is in reality just a straight line: a slender communication tower 243.5 meters high, whose verticality contrasts spectacularly with the horizontality of the landscape, a monolith of iron so thin that, during the day, it is often difficult to make out from a distance due to the often foggy local climate. “It’s a bit like our own Eiffel Tower!” explains a Houtem resident, recalling his great uncle amusing himself by “scaling” the structure at his own risk in order to observe the magnificent sunsets over the Belgian coast, this in spite of the sign installed at the base of the tower (“ATTENTION. Climbing of this tower is prohibited without prior approval of the commander”) and the fact that such an ascent is particularly long (over an hour) and dangerous if the climber is not harnessed to the “lifeline,” the vertical rope that runs to the peak of the tower. This tower, the fourth highest structure in Belgium even though its base sits 2 meters above sea level, stands up thanks to 48 guy-wires, taut cables between the tower and the eight anchor points solidly fixed in the middle of the field thanks to concrete stilts dug 15 meters deep, indispensable given the liquid nature of the ground. 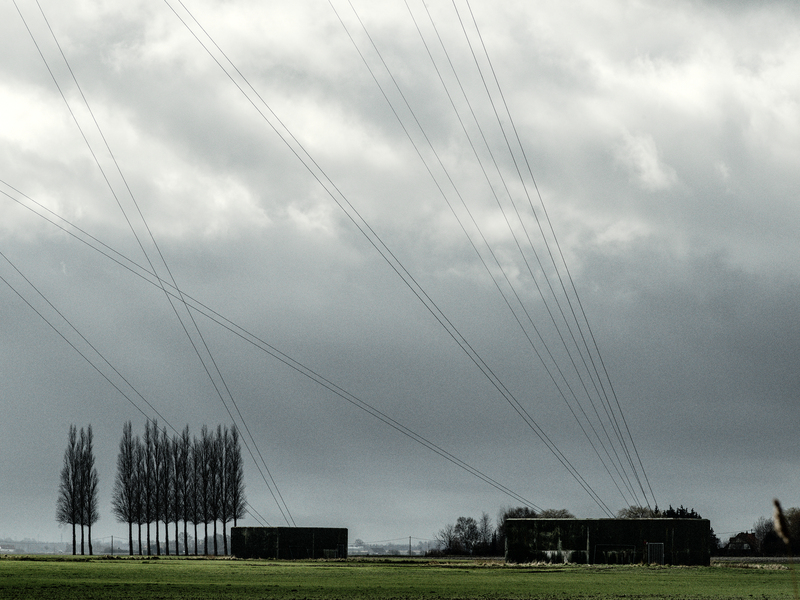 Thanks to the tension of the guy-wires, the 243.5 meters of the iron monolith—whose circular base, placed on a concrete block, measures only 20 centimeters in diameter—rise delicately into the sky, an immense vertical line prolonging the horizontal lines of the polder, in a silence disturbed only by that singular electric vibration caused by the wind whispering against the guy-wires. The various battles the polder had survived, from Caesar through World War II, involved visible and terrestrial military occupations, in which the water networks and straight lines played an essential role. From 2012 on, a new battle would be waged in the air, in a less visible manner, involving other networks in search of straight lines, and another kind of liquidity, this thanks to a new occupant which, forty years earlier, for geopolitical reasons, had taken possession of a terrain which it demarcated in the shape of a cross: the American army. The outcome of a military battle is only useful information if it gets shared. Aeschylus described, as early as 458 B.C., in his tragedy Agamemnon, how a communication network was used to reveal the name of the victor in the Trojan War to the residents of Mycenae, four hundred kilometers as the crow flies from the battlefield, in a single night: “From Ida’s top to Hephaestus, lord of fire, / Sent forth his sign; and on, and ever on, / Beacon to beacon sped the courier flame. / From Ida to the crag, that Hermes loves, / Of Lemnos; thence unto the steep sublime / Of Athos, throne of Zeus, the broad blaze flared. / Thence, raised aloft to shoot across the sea, / The moving light, rejoicing in its strength, / Sped from the pyre of pine, and urged its way, / In golden glory, like some strange new sun, / Onward, and reached Macistus’ watching heights.”The precision with which the locations are described makes it easy to map this route, which used a simple flame-generated light signal—the equivalent of a bit, in the computing sense—on several hills from which the signal could be seen from afar (Mount Ida, Mount Athos, Mount Cithaeron, etc. ), allowing the information to jump from one high point to the next until it arrived at its final destination. 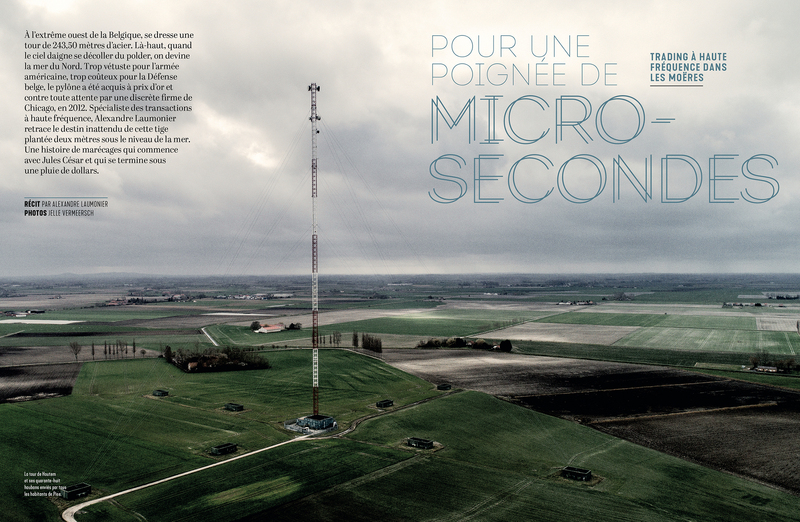 The altitude of broadcast relay stations is essential in the setup of high-speed aerial networks, and it was for the very same reason that the American army erected an elevated communication tower in Les Moëres: it needed to be able to shoot across the sea. The American communications networks, however, took longer than anticipated to be operational. According to a telegram sent from Brussels to the State Department in Washington on April 6, 1973 at 6 p.m. (cable declassified in 2005 and made public by WikiLeaks in 2011), the completion date for these installations, scheduled for the month of May 1973, could not be honored after contract renegotiations with Philco, a company manufacturing radio equipment. The message also specifies that, while some sites were almost completed, another was significantly behind due to the need for additional studies to verify soil density and to begin excavation works. Soldiers posted in Brussels also confirmed that they had encountered problems with other sites, not in Belgium but in England, and suggested postponing the start date until the beginning of 1974. We learn from this telegram that various military properties came to occupy Belgian lands, all of them equipped with communication towers, in Westrozebeke, Flobecq, Le Chenois, Ben-Ahin, and Houtem. Belgium did not have a major strategic importance for the United States—at least not yet—but this occupation could be explained by the flat country’s placement between two significantly more sensitive nations: England to the west, and Germany to the east. The American project extended beyond these three countries as well. It spread to the four corners of the globe under the name of the Defense Communication System (DCS), an ambitious program justified by the tensions of the Cold War and whose principal objective was to create, using radio waves, the local or global communications networks needed by the American Marines, Army, and Air Force, from the United States to Japan, passing through the Old Continent, the Middle East, the countries of the Persian Gulf, India and its surrounding countries, and along with all of this a network connecting the United States to England viaGreenland and Iceland. In Europe, the U.S. Air Force command center had been set up since 1952 in the famous German base of Ramstein. From this post the army created various networks extending westward to Belgium and England (where the United States could make use of towers erected by the Royal Air Force [RAF] during World War II), but also to the south, in Spain, Portugal, Italy, and Greece, all the way to Turkey, where forces installed a tower on the massif home to the same Mount Cithaeron cited by Aeschylus in his tragedy. This deployment of communication infrastructuretook another direction when, on March 7, 1966, on an impulse by General de Gaulle, France announced its intention to leave the integrated military command of the North Atlantic Treaty Organization (NATO). The following year, NATO headquarters moved to Brussels; the United States transferred over thirty air force, army, and naval bases to Belgium and Germany; and the new military command center, the Supreme Headquarters Allied Powers Europe (SHAPE), was established near the Belgian village of Mons, where it remains today. The organization, which at the time had its own communication network, Ace High, connecting Turkey to Norway by way of Greece, Italy, France, and England, through 82 relay stations, was also banned from French territory. NATO was thus obligated to use a new network, an “alternative route,” that circumnavigated the French hexagon to the east, passing through Switzerland, Germany, and Belgium, taking advantage of the military installations the United States had been establishing in the flat country since the Belgian-American agreements of 1963. 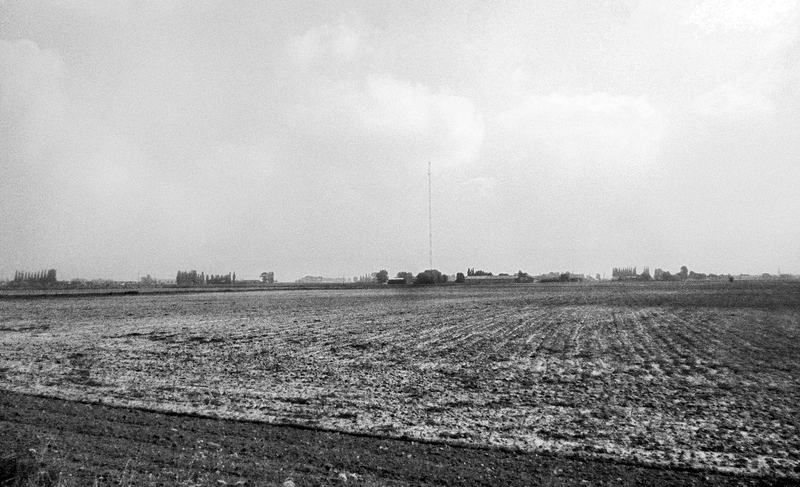 This was how the tower in Les Moëres, probably completed at the end of 1973, served the American Defense Communication System and NATO’s Ace High at the same time, the American army having made sure to erect the structure 300 meters from the Franco-Belgian border in order to avoid any diplomatic incidents with France should the pole catch fire and collapse on the wrong side of the border. According to a directory entitled United States Military Forces and Installations in Europe,published in 1989, the tower in Les Moëres was used by DCS and by Ace High for troposcatter communications. These connections use ultra-high-frequency waves (between 300 MHz and 3 GHz) reflected by the troposphere (the layer of the atmosphere closest to the Earth), allowing encoded information in the radio signal to travel up to 300 kilometers between two relay stations. They were thus used more to connect the continents to one another than for solely “terrestrial” networks. According to a former U.S. Air Force sergeant who worked on the maintenance of European networks, the tropospheric antennas in in Houtem played a crucial role in the operation ensuring the repatriation to Europe of soldiers who had been victims of a suicide bombing committed in October 1983 by the Islamic Jihad Organization, an attack that heavily impacted an American contingent based in Beirut. But United States Military Forces and Installations in Europealso mentions that the tower was used chiefly for other types of radio connections. It seems to have even constituted a veritable case study, as three articles published three years after its erection attest: “The use of multiple diversity to minimize the effects of ducting on a long microwave path” (1975), “Delay line requirements for Houtem-Swingate link” (1976), and “Signal level distributions and fade event analyses for a 5 GHz microwave link across the English Channel” (1979). This last was published by the American Department of Commerce, itself mandated by the U.S. Air Force to run “point-to-point” connection tests with the aid of microwaves. Unlike ultra-high frequency waves, microwaves (from 1 to 300 GHz) cannot reach the heights of the troposphere. They require two dishes placed in “line of sight” formation, or two dishes that absolutely must be visible to one another, since the optimal signal propagation between the two relays is horizontal—or more precisely geodesic, the Earth being a sphere. As the earth’s curvature hardly allows each “hop,” or the distance between two parabolas, to exceed 100 kilometers, the “Hertzian beams” are used for “continental,” not global, networks. 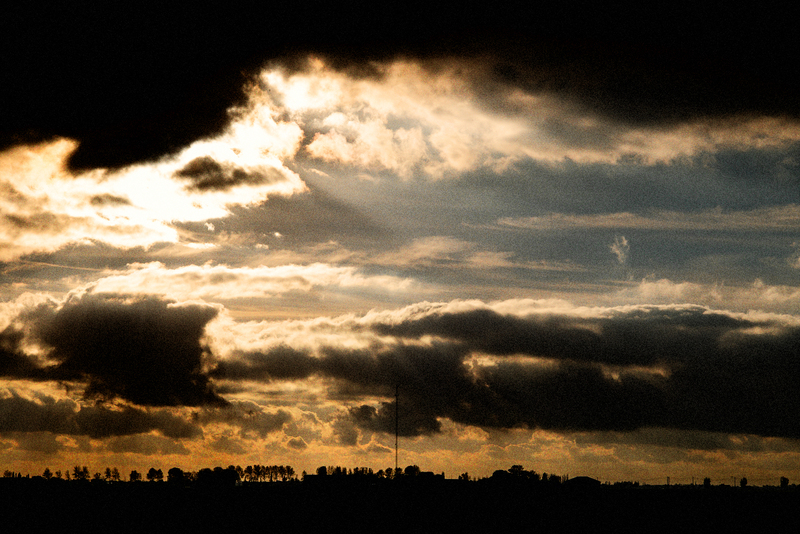 The three articles dedicated to the tower in Les Moëres tell us it was erected a few kilometers from the coast so that the American army could create a point-to-point microwave path between Houtem and Swingate, in England, or a hop of 88 kilometers. In the 1960s, when this radio hop was created, the village of Swingate, north of Dover, was dominated by the famous Three Sisters: three masts only 111 meters high, erected by the RAF between 1936 and 1938 to track German fighter planes near the English coasts. The Three Sisters were themselves part of the Chain Home, a vast set of radars used to monitor the presence of foreign aircraft. One of the posts, threatening to crumble, was destroyed in 2010, but two years later, at the moment the Belgian government was considering putting the Houtem tower up for sale, the Two still-valiant Sisters were classified as “historical monuments” for the services they had rendered during World War II (after the conflict was over, the two English sisters were also used by Ace High, the NATO network, until the 1980s). The Houtem property is mentioned one final time, ten years later, in a report by the American Department of Defense, Base Structure Report. Fiscal Year 1999, which surveyed all American military assets spread throughout the world. Mention is made therein of a “Houtem Radio Relay Site,” identified as “active” although the report suggests the site was no longer a real priority, even that it was no longer in use at all. It is estimated, for instance, that the budget necessary for a real renovation of the tower, given the state of obsolescence of the infrastructure and the new norms in place, would be 1.2 million euros—making it, by surface area, one of the highest restoration costs of the era for an American property established in Belgium. So the United States abandoned Houtem, until the communiqué dated January 20, 2006, in which the Defense Department “announced the decision to inactivate and return three microwave radio relay sites to Belgium: Houtem, Westrozebeke et Flobecq. Closure of these sites will result in an estimated annual savings of $84,000 based on a comparison of the current annual operations and maintenance costs to an annual replacement commercial communications cost. These actions will permit more resources to be focused on other U.S. Air Forces Europe (USAFE) mission requirements. The United States no longer requires these sites since the service provided by the radio relay system installed in 1996 will be replaced by higher-capacity, lower cost commercial communications service.” Without explicitly saying so, the army made it clear that its communications would no longer travel through the air but under the ground, thanks to a newer technology than radio waves: fiber optics, which offer twice the bandwidth. The American army’s conversion to cables, signaling the end of a long period of investment in radio infrastructures in Belgium, should have marked the definitive dismantling of the iron monolith—had other Americans, against all expectations, not turned up in Houtem in December 2012. Wenceslas Cobergher had molded the new lands of Les Moëres as a shared economic space where the “public good,” dear to Leonardus Lessius, and a form of “communality” might prevail against those who sought to “dominate the market.” Some centuries later, a Chicago firm’s acquisition of the Houtem tower, which it refused to share with anyone else, revealed that occupation had become a private matter for those who sought to master the markets by using an immense tower to dominate the landscape. A new kind of battle over liquidity would now reign in Les Moëres, one in which the waves sent forth by the Chicago company would cross, in the fogs of the North Sea, those of competitors no less greedy for speed, and sometimes for liquidity—a new kind of occupation of space: aerial, nearly invisible, and silent. See Sylvain Piron, L’Occupation du monde (Brussels: Zones sensibles, 2018). See Wim Decock, “Le marché du mérite“: Thinking Law and Economics with Leonardus Lessius (Brussels: Zones sensibles, 2019). Translation by E. D. A. Morshead (1881).